KANATA PROPERTIES, ​our sister company, is proud to present fine collection of apart-hotels located in the heart of Miraflores, Lima’s trendiest district. Our well-appointed and fully-furnished apartments come with a wide variety of amenities designed to provide you with maximum comfort. They range from maid service to WIFI internet to multi-channel cable TV. Moreover, our apartment’s proximity to everything- from jogging trails, to beaches and cafes, makes it unnecessary to rent a car or hire a taxi. So why not give us a try? In fact, most of our guests are repeat guests! And that is something we are proud of! So come and join us and enjoy the pleasure of true urban living. To make it easier to book, we have classified our one-bedroom properties into three categories. Heading the list is DIVALI, our superior category and spacious one-bedroom apartment; TEOCALLI and ODIN, the standard category mini-apartments; APOLLO and MITHRAS, our two smaller "Basic" category petit studios. DIVALI (superior category). Our most popular and spacious apartment comes with a king-size bed, a bathroom, a living/dining area with a fully-equipped kitchenette and a dining-room with a table large enough to accommodate six. It also includes, among other amenities, coffee-maker; multi-channel cable TV with a DVD; fast-speed 8b WIFI internet service. TEOCALLI (boutique apartment). Our one bedroom boutique apt. comes with a double-size bed, a living room, a dining room area, a bathroom, and a fully-equipped kitchenette. It also includes amenities such as multi-channel TV and fast-speed 8b WIFI internet service. ODIN (standard category). 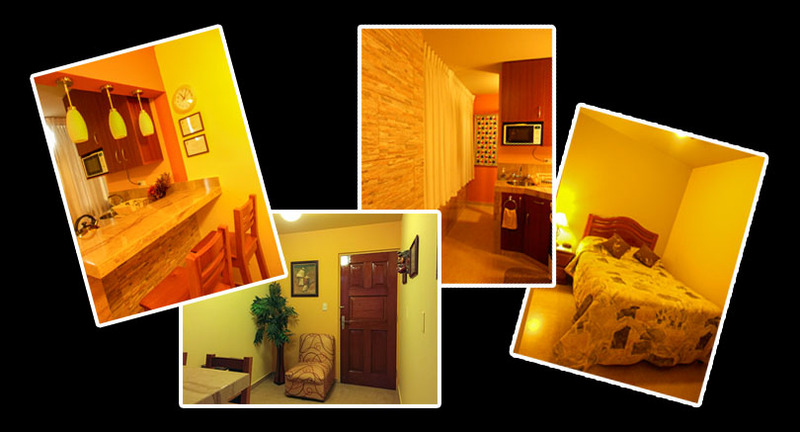 Our petit-apartment, wired for WIFI internet service, includes a bedroom with a king-size bed; a bathroom; a living-dining room area with multi-channel TV and a fully-equipped kitchenette with a refrigerator. APOLLO (basic category). Our petit studio comes with a bathroom, a double-size bed and a petit living/dining/kitchen area with a Frigo-bar, microwave, hot plates and other amenities. It also includes multi-channel Cable TV and WIFI internet service. MITHRAS (basic category). Our petit studio comes with a bathroom, a double-size bed and a petit living/dining/kitchen area with a Frigo-bar, microwave, hot plates and other amenities. It also includes multi-channel Cable TV and WIFI internet service. 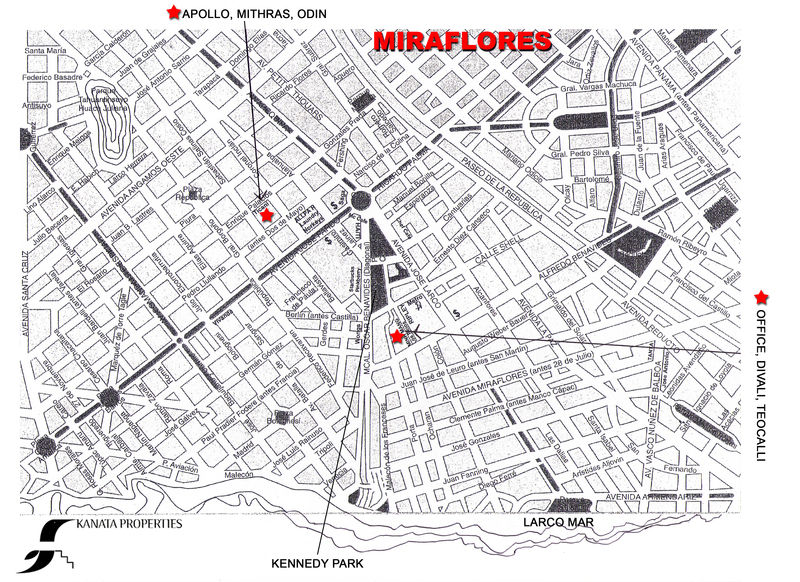 Please refer to the map below to access the locations of our Miraflores apartments.